Last week's ride from Wayne was well attended with a great group of 15 riders. Many thanks to the ride leader, Frank Rosen, for putting together such a nice route. 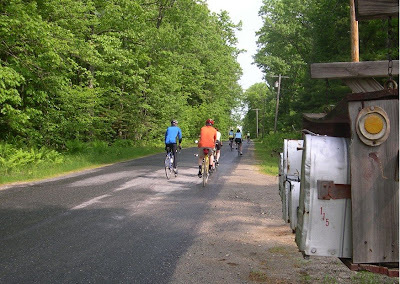 This Saturday's ride will start in Hallowell, courtesy of John Schooley. See you then! "Hallowell Fare-thee-well" - a scenic tour over hill and dale through Hallowell and Litchfield. START: 10:00 AM, Hall-Dale Elementary School, 26 Garden Lane off of Winthrop Street in Hallowell. HIGHLIGHTS: a new route on the back roads west of Hallowell. Additional note from John: I have been exploring the West side of the Kennebec from my new home in Hallowell, and have found back roads, ponds and even an eagle's nest along the 25+/- mile ride this coming Saturday. We will start with an easy glide down a few of the streets in Hallowell passing manses and peak landscape foliage. We will then take a steady climb along Middle Street passing Vaughn Woods and heading out past Rollins Furniture and coming back by Jamie Pond, Maple Hill Farms and the Cohen Center back to the Hall-Dale Elementary school off of Winthrop Street. I hope you will consider a post-ride lunch or snack in downtown Hallowell, where we can probably sit outside by the river.